Home / .#Politics / #AmericanRoadRadio / #Chronicles / #DonaldPresident / #US_Politics / #USChronicles / #USLocal / Democrat Party / Democrats / Donald Trump / GOP / #Midterm : A record number of women were elected to the House of Representatives in Tuesday ! #Midterm : A record number of women were elected to the House of Representatives in Tuesday ! A record number of women were elected to the House of Representatives on Tuesday; as of early Wednesday morning, at least 95 women had won seats, breaking the current session's record of 84 women. Twenty-five races with at least one female candidate were left undecided. 11 women won Senate bids and 9 women won gubernatorial races. And it's not just in the numbers: Alexandria Ocasio-Cortez is the youngest woman elected to the House, while Ilhan Omar and Rashida Tlaib are the first Muslim women elected to the House. 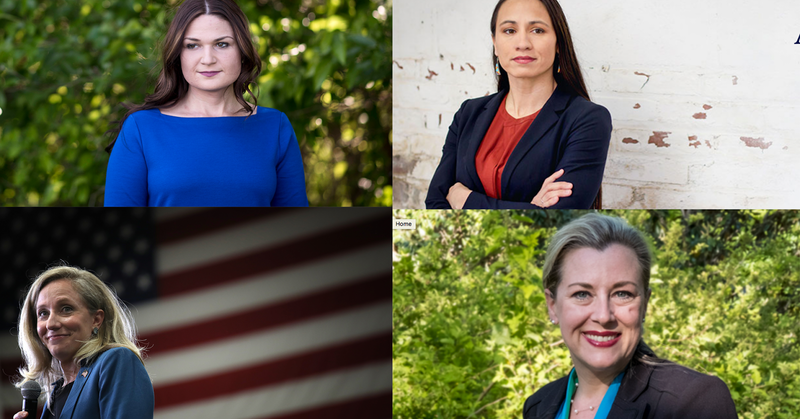 Sharice Davids, a lesbian, lawyer, and former mixed martial arts fighter, defeated a Republican incumbent in Kansas and will join Debra Haaland of New Mexico, another winning Democrat on Tuesday, as the first Native American women elected to Congress. Women were responsible for a slew of Democratic gains key to retaking control of the House, as well: Elaine Luria, a Democrat, won in Virginia's 2nd District, and Jennifer Wexton, a Democrat, won in Virginia's 10th. Democrat Abby Finekenaur won in Iowa's 1st Congressional District, and Abigail Spanberger did so in Virginia's 7th District. All defeated Republican incumbents. There were a handful of surprises — Democrat Kendra Horn surprised the nation by winning a safe Republican seat in Oklahoma's 5th Congressional District, too — and some notable losses by women candidates. Amy McGrath, a former fighter pilot, lost her bid for the House in Kentucky and North Dakota Sen. Heidi Heitkamp lost her re-election race. Nine women won governorships, tying a previous record for the number of women who hold their state's highest office. All four incumbent women governors — Alabama's Republican Kay Ivey, Iowa's Republican Kim Reynolds, Rhode Island's Democrat Gina Raimondo, and Oregon's Democrat Kate Brown all held their seats — but governor's mansions around the country will also see fresh faces, too. Democrat Laura Kelly defeated Republican Secretary of State Kris Kobach in Kansas, Democrat Gretchen Whitmer won in Michigan, and Democrat Janet Mills won in Maine. The record could still be broken if Georgia's Stacey Abrams — whose race is currently too early to call with Republican Brian Kemp in the lead, according to NBC News — wins the seat. The surge of women was fueled almost entirely by Democrats, who sent a slew of new faces to Congress. This, of course, is because they put an unheard of number of women on the ballot by voting again and again for women in their primaries. Half of all nonincumbent Democratic nominees to the House were women, compared to just 18 percent of nonincumbent Republican House nominees. Of the 276 women on the ballot Tuesday in House, Senate and governor's races, 77 percent were Democrats. These women didn’t just break records: They set the political playbook on fire, with armies of first-time candidates running as outsiders and throwing out the conventional wisdom that women must be twice as qualified, twice as polished and twice as careful as their male counterparts to mount a successful bid. While in past years, women ran for state and local office first, this year’s races attracted women from all walks of life to shoot for Congress or the governor's mansion in their first campaign: fighter pilots, teachers, executives, nurses, and moms who were so fed up with politics they decided to run themselves. The wave of women this year could, some hope, change things forever in a political world that has been dominated by men since the all-male assemblies of Athens. If women like Iowa's Finkenauer, a 29-year-old Democrat who talks freely about her student loans in a bid against a tea party Republican incumbent, and Georgia's Lucy McBath, a flight attendant whose son's murder propelled her into politics, can run for Congress, then the possibilities of who else might follow them expands drastically.